Liquidity – ability to perform transaction without cost. Kyle – tightness, depth, resilency. 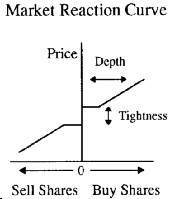 depth – volume that can be traded at the current price level. Agenor, R. and J. Aizenman, 1997, “Contagion and volatility with imperfect credit markets,” manuscript, the International Monetary Fund, Washington DC. Aizenman, J. and N. Marion, 1993. “Policy Uncertainty, Persistence and Growth,” Review of International Economics, Vol. 2, 145-163. Bernanke B. S. and M. Gertler, 1989, “Agency costs, net worth and business fluctuations,” American Economic Review, 79, pp. 14-31. Bulow, J. I. and K. Rogoff, 1989, “A constant reconstructing model of sovereign debt,” Journal of Political Economy 97, pp. 155-78. Calvo, G. A. and E. Mendoza E., 1997, “Rational herd behavior and the globalization of securities markets,” discussion paper #120, Federal Reserve Bank of Minneapolis. Eaton, J., M. Gersovitz and J. Stiglitz, 1986, “The Pure Theory of Country Risk”, European Economic Review; 30(3), June, pp. 481-513. Edwards S. and C. Vegh, 1997, “Banks and Macroeconomics Disturbances under Predetermined Exchange Rates”, NBER Working Paper No. 5977. Hausmann, R. and M. Gavin, 1995. Overcoming Volatility, Special Report, in Economic and Social Progress in Latin America, Inter-America Development Bank. Helpman, E., 1989, “The Simple Analytics of Debt-Equity Swaps,” American Economic Review; 79 (3), pp. 440-51. Ghosal V. and P. Loungani, “Product Markets Competition and the Impact of Price Uncertainty in Investment,” Journal of Industrial Economics, 1996, pp. 217-228. Jaffee, D. and Stiglitz, J., 1990, “Credit Rationing,” in Handbook of monetary economics. Volume 2, Friedman B. and F. Hahn, eds., North Holland, pp. 837- 88. Pindyck, R. S. and A. Solimano, 1993. “Economic Instability and Aggregate Investment,” NBER Macroeconomics Annual , pp. 259-302. Ramey, G. and V. A. Ramey, 1995. “Cross-country evidence on the link between volatility and growth,” American Economic Review, December, pp. 113% 115 1. Sachs J., A. Tornell and A. Velasco, 1996, “Financial crises in emerging markets: The Lessons from 1995: NBER Working Paper No. 5576. Stiglitz, J. and A. Weiss, 1983, “Alternative Approaches to Analyzing Markets with Asymmetric Information: Reply” American Economic Review; March, pp. 246-49. Townsend, R. M., 1979, Optimal contracts and competitive markets with costly state verification, Journal of Economic Theory, pp. 265-93. Williamson, S. D., 1986, “Costly monitoring, financial intermediation, and equilibrium credit rationing”, Journal of Monetary Economics 18, pp. 159- 179.